I don’t personally know Felix Weisner but I am familiar with his work, mainly a series of games about a shark destroying everything in his path for no apparent reason. I mean, does a shark really need a reason to cause massive amounts of damage to anything or anyone in his path? Of course not, that’s why the Discovery Channel dedicates a whole week to the ocean’s biggest badass. 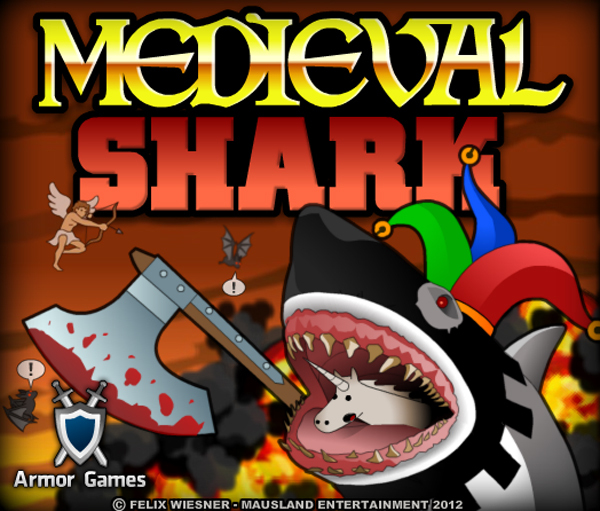 In Medieval Shark, Mr. Weisner has added a prequel of sorts to his epic franchise, placing our finned protagonist back in medieval times with just as much blood lust as he has in the modern era. This time, however he’s armed with weapons and must face off against everything from ships and castles to mythological beasts of all shapes and varieties. I think I even killed a cherub at one point, though everything was exploding so I’m not quite sure. I’d tell you how to play the game but I’m not totally positive I even know how or why I did the things that I did. 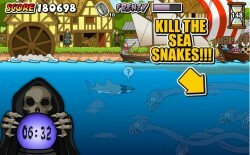 You control the shark’s movement with the arrow keys and press A to attack . There’s also a mechanic in place that allows you to jump higher into the air by diving deep into the water and surfacing quickly, you know, in order to take down anything that happens to be flying above you. In between killing/destroying there’s also treasure to be found. Then, the Grim Reaper popped up a couple different times to tell me something though I missed the message since I was preoccupied with the chaos. This is a game about witnessing the harsh realities of what things would be like if a shark somehow found a way to travel back in time, a PSA of sorts if you will. In addition to warning us about the devastating consequences of time traveling sharks, Medieval Shark is also the best way to start a rainy day, wake up people from comas and even enhance one’s genitalia (or at least that’s what is claimed in the following infomercial). Cheap and Dirty Gamer: New York Shark, Crazy Killing Machine Shark or Medicine Man Shark?